Intel created the moniker "Ultrabook" to describe a premium category of subnotebooks. Initially, the prices were high: most systems fulfilling the criteria retailed for north of 1000 Euros (~$1300). While most first generation Ultrabooks featured high-end processors, HP now equips their Envy 4-1000sg with an Intel Core i3-2367M and offers it for around 600 Euros (~$780). 4 GB RAM and a hard drive of 320 GB capacity - certainly at the lower end of what constitutes the minimum acceptable standard nowadays - round out the hardware and keep the price low. To aid in faster wake-up times from sleep mode and quicker response times, the hard drive is supported by 32 GB of ExpressCache (a common practice to boost the performance of conventional hard drives in Ultrabooks). Quite a few Ultrabooks and subnotebooks with AMD hardware compete in the same price segment - like the Samsung Series 5 535U4C, which is also a 14-inch system, but comes equipped with 8 GB RAM, dedicated GPU, and DVD RW optical drive. Samsung is able to control the price by using less expensive (and less powerful) AMD hardware. Asus was one of the early adopters of the Ultrabook standard with their Zenbook series. The Asus UX32A-R3001V constitutes the entry-level Zenbook - it features the same processor, but comes a bit better equipped. It is also about 100 - 200 Euros (~$130 - ~$260) more expensive. Around the same price point - and equipped with the same CPU - Sony offers their compromise of an upscale yet inexpensive system: the Vaio SVT-1111M1E/S. The HP Envy 6-1000sg is the bigger brother of our review model, equipped with a 15.6-inch display, but the same resolution. This Ultrabook comes equipped with a (more powerful) Ivy Bridge Intel Core i5-3317U and a dedicated AMD Radeon HD 7670M. Weighing in at 2.2 kilograms (4.85 pounds), the Envy 6 is only about 400 grams (0.88 pounds) heavier, but offers more performance for only 100 Euros (~$130) more. We will try to determine how the Envy 4 compares and if it is really a good alternative. Although the Ultrabook is offered at a price point that had to require some compromises along the way, both the design of the chassis and the material selection manage to impress: the lid and the palm rest are made from black, brushed aluminum, while the underside is a matte red and makes for a visually appealing contrast. The chassis mirrors the one of the HP Envy 6-1000sg - down to the susceptibility of the surface areas for dirt and fingerprints. The high-end aluminum requires more frequent cleanings with a cloth than matte plastic would - the palm rest is especially prone to prints and smudges. The weight of 1.8 kilograms (3.97 pounds) is on par with similar notebooks; the thickness of almost 2 centimeters (0.79 inches) is on par with the (larger) Envy 6. Stability is comparable as well: the hinges manage to hold the torsionally not very rigid display securely in any position without any noticeable wobbles when opening the lid or when the notebook is subjected to vibrations. 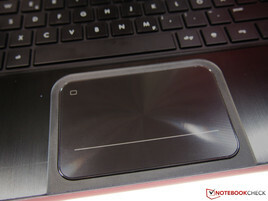 The red underside is quite sturdy for an Ultrabook - we already commended this feature when we reviewed the Envy 6. HP generally has a good reputation as far as the design of their chassis is concerned - and the Envy 4 is no exception. Overall, we consider the quality above average for this price segment. Thin Ultrabooks frequently don't offer a lot of ports, and dongles are usually not an option in this price range. The Envy 4-1000sg has all the necessary ports: the left side houses two USB 3.0 ports, HDMI, a card reader, and a Gigabit LAN connector (which features a spring-loaded cover). The right side is home to the power jack, a USB 2.0 port, audio jacks, and the Kensington Lock slot. The port selection mirrors the one of the bigger brother Envy 6. Like the Envy 6, our review model features a Broadcom module (type 4313GN). The module supports all current WLAN standards (802.11b/g/n) and Bluetooth. 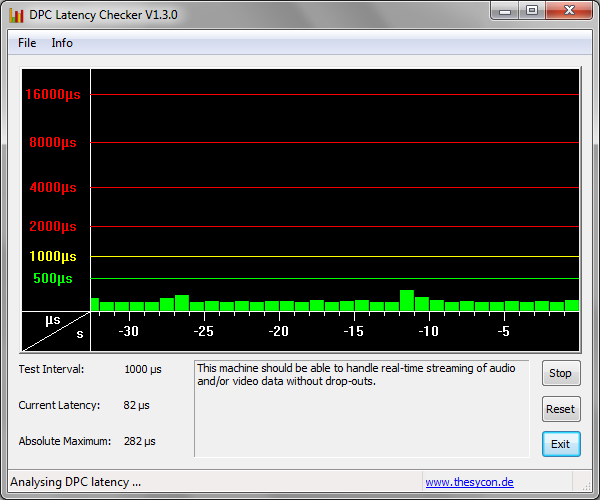 We measured a data transfer rate of 72 MBit per second - a bit on the low side. The range is also not exactly overwhelming which could lead to issues if the access point is a bit farther away. Bluetooth is still version 3.0 - not that this should really pose many issues, since the newer standard doesn't offer many additional features. In addition to the usual pamphlet and warranty information, the box only includes the power adapter. A recovery DVD is not included - most likely since the notebook does not feature an optical drive. The amount of bloatware is also limited - thankfully so. When using the Starter Edition of Office 2010, the user has to contend with Microsoft ads. Accessing the internal components (like the hard drive or RAM) is not exactly easy: twelve screws need to be unscrewed before the bottom cover can be removed. Business notebooks generally allow for easier access. In some countries, Hewlett Packard offers the Envy 4-1000sg with a 24 month limited hardware warranty with pickup and return service. The warranty can be extended to 36 months starting at 105.91 Euros (~$139). 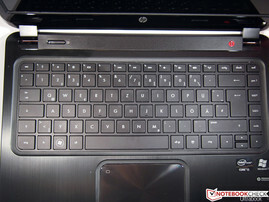 The keyboard is a chiclet design and a carryover from the HP Envy 6-1000sg. The overall impression is positive: the keyboard is slightly recessed and the top of the keys are on the same level as the palm rest. The short keystroke is paired with good feedback and allows for a comfortable and speedy typing experience. The space between the keys actually aids in finding the correct placement for the fingers. Some users might not appreciate the smaller arrow keys or the smaller keys in the function row. We should also mention the LEDs which illuminate some keys, like volume (when deactivated), WLAN, and Caps Lock. This thoughtful and nice looking addition adds to the upscale impression. A little bit unusual is the reverse configuration of the Fn keys, which allows for direct access of display brightness, volume levels, and the WLAN on/off switch. 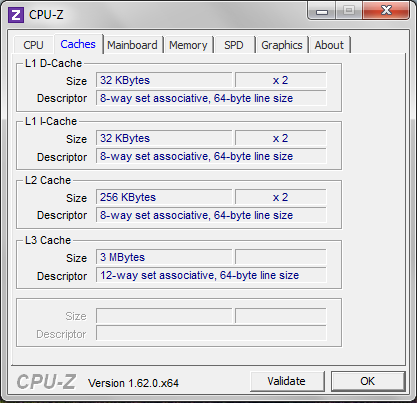 Those who would like to use F1 to F12 directly can change a setting in the BIOS. The touchpad is also unchanged: it measures 11 x 7 centimeters (4.33 x 2.76 inches) and is also recessed a bit. The pad features a plastic surface with a concentric pattern. Fingers glide easily which allows for precise cursor control. Multitouch gestures (scrolling with two fingers or pinch to zoom, for example) are supported and work without a hitch. A double tap on the left upper corner deactivates the touchpad (a little orange LED indicates when the touchpad is off). The two lower corners function as mouse buttons and offer a well-defined click point. 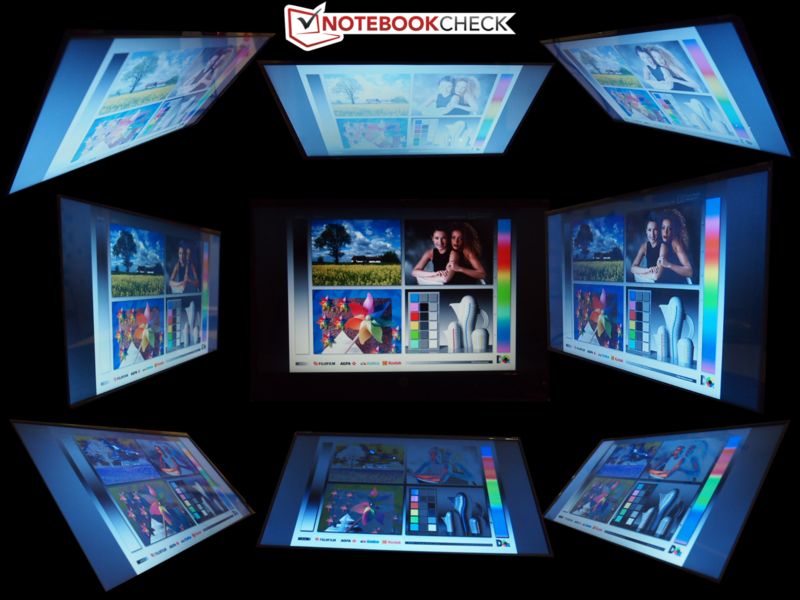 The reflective 14-inch display features a standard resolution of 1366x768 pixels and a 16:9 aspect ratio. Only more expensive notebooks offer higher pixel density - even the HP Envy 6, which has a larger display of 15.6-inches, features the same resolution. Unfortunately, the Envy 4-1000sg suffers from the same weaknesses we noted when we reviewed the Envy 6. The display measurements are pretty disappointing: a maximum brightness of only 168 cd/m², for example, is what we would expect to see on notebooks in the bottom price bracket. The contrast ratio of 165:1 is also very low. In order for the Ultrabook to be suitable for outdoor use without any reservations, those values should be a least double that. 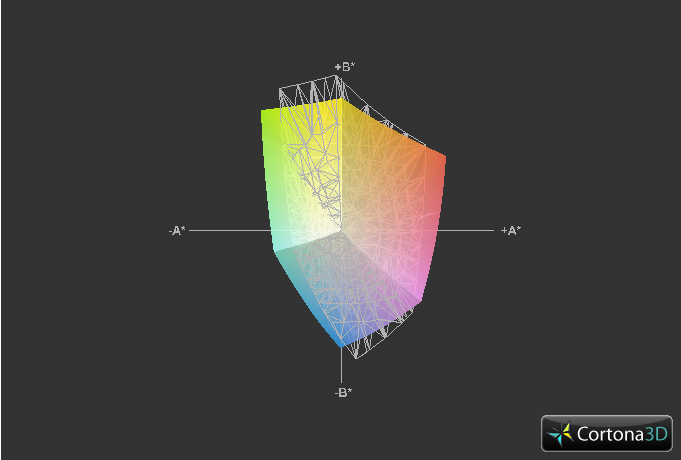 A good quality screen can be had even in this price range - case in point: the Samsung Series 5 535U4C reaches a screen brightness of 300 cd/m²; the display of the Asus UX32A-R3001V features a contrast ratio of 513:1. 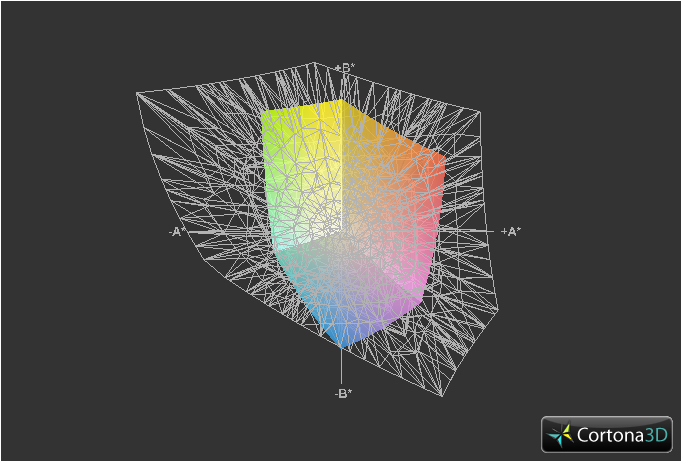 Since the contrast is quite low, the black point of 1.0 cd/m² is not surprising. The average brightness distribution of 95% is actually quite decent and means a uniform brightness level. The color gamut is as expected for a notebook in this price range: the display doesn't even get close to covering sRGB and especially AdobeRGB. 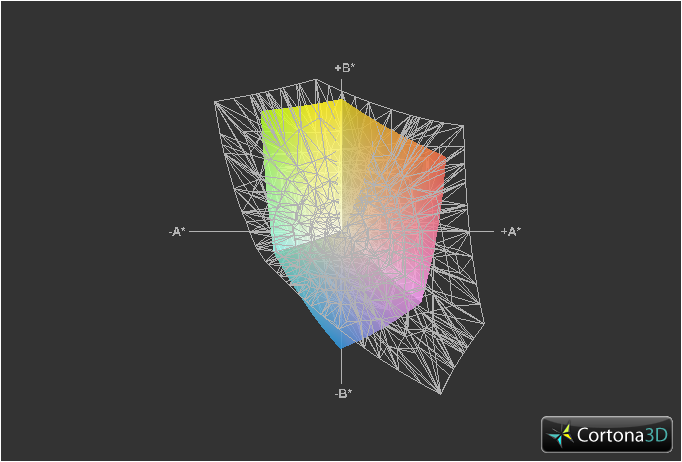 Color accuracy is normally not of the utmost importance to the average user - although it matters a great deal to professionals who work with photos or graphics. The viewing angle stability, on the other hand, is important - especially if there are additional users trying to watch a movie. The fact that this is a low-priced panel becomes apparent once again: in the vertical plane, the picture inverts quickly if the user is not directly in front of the screen. Horizontal viewing angles are slightly better but of course the viewing angle stability is not nearly as good as what a higher quality (and more expensive) IPS display is capable of (see Asus Zenbook UX32VD). Ultrabooks make use of ULV processors - but the low price of 650 Euros (~$850) prohibits the use of a current high-end CPU. At least that seems to be what HP was thinking: the Envy 4-1000sg comes equipped with an Intel Core i3-2367M - a previous generation Sandy Bridge processor with a low clock speed of 1.4 GHz. Turbo Boost is not supported (so the processor can't be temporarily overclocked) but Hyper-Threading is - so the CPU can at least address two threads per core (for a total of four cores). The processor also features the integrated Intel HD Graphics 3000, which should be sufficient for simple tasks like surfing or office duties. 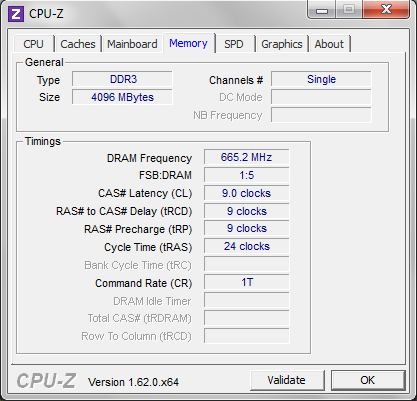 The system uses a single 4 GB DDR3 SDRAM module. We consider this amount to be the bare minimum, although it should be enough for the average user. 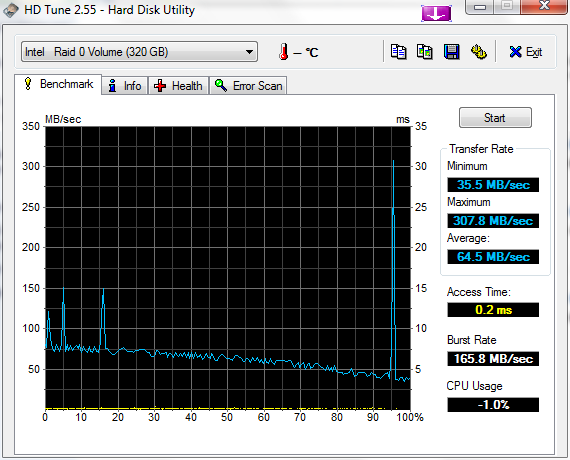 The hard drive features a capacity of 320 GB and spins at 5400 RPM - again: sufficient, but certainly far from generous. At least the performance is not bad, as the hard drive is supported by 32 GB ExpressCache, which increase boot and wake-up speeds and generally improves working with the notebook. We mentioned it earlier: the Core i3 processor is no powerhouse and constitutes the bottom end as far as CPUs in current generation Ultrabooks are concerned. Consequently, we don't expect overwhelming results from the Cinebench tests R10 and R11.5. The 15.6-inch Envy 6-1000sg comes equipped with the Ivy Bridge Intel Core i5-3317 - a CPU which should be both more powerful and energy efficient. The tests confirm it: the i5 scores almost double the points - and the Envy 6 only retails for 100 Euros (~$130) more. The price difference between the HP Envy 4-1000sg and the Samsung Series 5 535U4C is even less - the street prices are almost the same. Both are 14-inch systems; but technically the Samsung is not an Ultrabook, since it's using AMD hardware (AMD A6-4455M). The Samsung fulfills the other requirements of the Ultrabook standard, so from a user experience there is not that much of a difference. As far as performance is concerned, the results are not quite consistent: while the Intel Core i3 trails the AMD processor slightly in the Single-Core Rendering Test, it pulls ahead by quite a margin (35%) during the Multi-Core Test. To evaluate overall system performance, we use the benchmark test PCMark. The HP Envy 4 scores 4917 points in PCMark Vantage and outperforms the aforementioned Samsung notebook by about 20%. 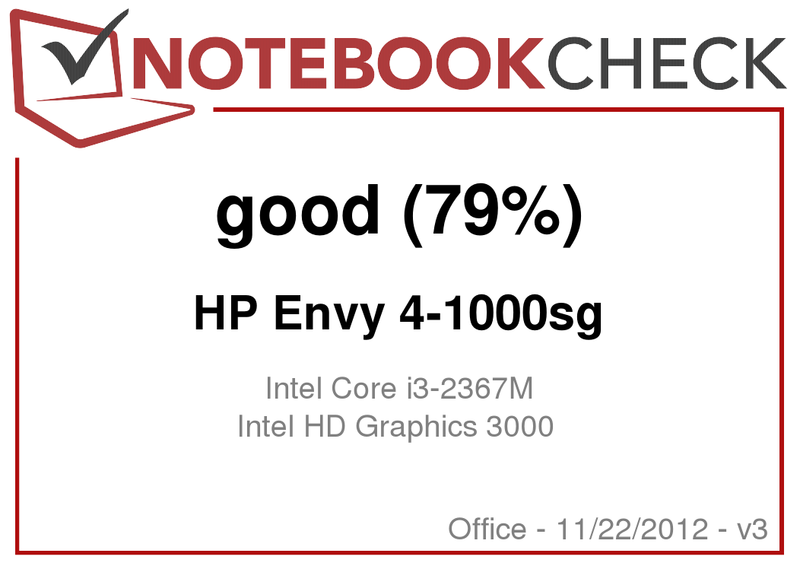 Our review model has no chance against the HP Envy 6-1000sg (equipped with the Ivy Bridge i5-3317U and dedicated Radeon HD 7670M) and only manages to score about two-thirds of the points. HP equips the Envy 4-1000sg with a Hitachi hard drive (model HTS545032A7E380), which features a capacity of 320 GB and a rotational speed of 5400 RPM. The average read speed of 64.7 MB/s places this hard drive firmly in the middle of the competition. The maximum (burst) speeds of 300 MB/s are courtesy of the 32 GB SSD cache drive, which is completely invisible to the user. This small SSD functions as temporary storage to speed up boot times, wake-up time from sleep, and helps to accelerate program starts and execution. Of course a "true" Solid State Drive would offer higher performance - but at significantly increased cost for the same capacity. The hybrid drive is a good compromise between cost and speed. 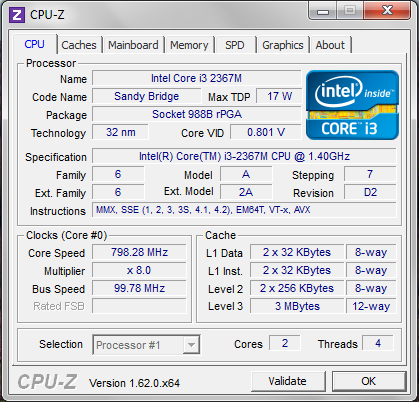 Sandy Bridge processors are equipped with the Intel HD Graphics 3000 GPU, which is based on a 32 nanometer process and only supports DirectX 10.1. The successor Intel HD Graphics 4000 features shaders which are DirectX 11 compatible, 16 instead of 12 graphic pipelines, and up to 60% more graphics power. To compare 3D performance, we use the 3DMark Vantage, since 3DMark 11 requires DirectX 11 support. The result of 1264 points is, as expected, not overly exciting. The larger Envy 6-1000sg features the significantly more powerful Intel HD Graphics 4000 and the integrated Radeon HD 7670M to boot - enough for roughly four times the performance. 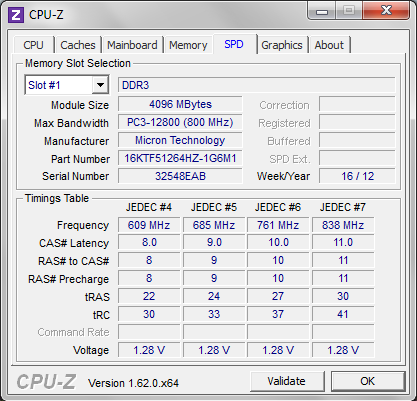 Even the Samsung Series 5 535U4C, which comes with the lower-performing AMD CPU but stronger Radeon graphics card, is able to roughly double the result of the Intel HD Graphics 3000. While the GPU inside the i3 processor is enough for simple desktop tasks, it's not nearly strong enough to deliver the 3D performance needed for games. The mediocre result of the integrated GPU is not the best basis for a system suitable for gaming. Consequently, we have very modest expectations as far as the gaming performance is concerned. Some games, however, are not going to require high-end hardware - we chose Starcraft 2 and FIFA 13 as examples of this category. The older Starcraft 2 does not pose significant problems for the Ultrabook: with details and resolution set to low, we recorded 66 frames per second. More details and the native resolutions hamper the performance significantly, as the frame rate dropped to a rather unplayable 18 fps. Nobody would want to play a game with the resolution set to its lowest setting - but the native resolution and details set to low are a workable compromise. The fairly recent FIFA 13 normally shows good results even on pretty average notebook hardware - but the HP Envy 4-1000sg is a different story: even with details set to low and the lowest resolution, we were only able to eke out 19 fps. The game doesn't really stutter and remains playable, although it is not a lot of fun. All in all, the performance of the GPU is quite low - other notebooks with a Sandy Bridge CPU do way better here (see FIFA 13 benchmarked). We tried different settings and updated the drivers to no avail. The Envy 4 is definitely not an Ultrabook suitable for even occasional gaming. Those so inclined should consider spending 100 Euros (~$130) more for the 15.6-inch Envy 6, which (because of the Ivy Bridge CPU and dedicated Radeon GPU) offers significantly higher frame rates. Ultrabooks - small, chic, and quiet? The last attribute can definitely not be applied to the Envy 4, even if the other two can. Although the recorded 30 - 40 dB are not out of the norm, the fan turns on and off frequently - even while the user is performing simple office tasks or surfing the internet. The fan emits a permanent high-frequency sound - obviously the system is not capable of low enough RMPs to remain inaudible. Unfortunately, HP's Ultrabook does not allow the user to choose different settings to control the fan like the Samsung 535U4C does - so the high-pitched sound gets annoying fairly quickly and takes away from the great first impression. Since the fan is running more or less constantly, one would think that the temperatures are well controlled. Unfortunately that's not the case. The system reaches up to 40 °C (104 °F) during idle and up to 60 °C (140 °F) during the stress test. Compared to the other notebooks we mentioned, the recorded top temperature is higher by about 10 °C (18 °F). Overall, we still consider the temperatures to be acceptable, since the notebook remains cool enough when performing simple tasks. 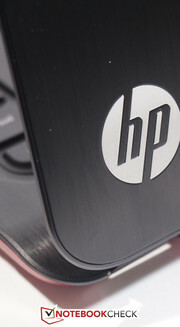 HP employs their CoolSense technology, which supposedly leads to lower temperatures, as the internal components and cooling slots have been rearranged. Considering the above-average temperature under load, we are not able to substantiate HP's claim. During our stress test (using Prime95 and FurMark), the i3 CPU doesn't get overly warm when compared to other (admittedly more powerful) ULV processors - the internal sensor recorded a maximum of 67 °C (152.6 °F). Considering that, the temperatures on the surface are all the more surprising - CoolSense technology and always-on fan notwithstanding. Other Ultrabooks feature more efficient cooling systems. At least both CPU and GPU tests show now decline in performance when we conducted them after the stress test. (-) The average temperature for the upper side under maximal load is 40.5 °C / 105 F, compared to the average of 29.4 °C / 85 F for the devices in the class Office. (-) The maximum temperature on the upper side is 51.7 °C / 125 F, compared to the average of 33.9 °C / 93 F, ranging from 21.2 to 62.5 °C for the class Office. Just like the HP Envy 6-1000sg, the Envy 4 uses Beats Audio components and thus promises high quality sound. Similar to the bigger brother (which sounds pretty much identical), our review model features two speakers and a subwoofer. The 2.1 audio system definitely lacks bass, even though the software equalizer ("Beats Audio Control Panel“) allows the user to change some settings. Although the highs are somewhat over-emphasized, the quality is certainly good enough for the occasional movie or for listening to music sometimes. Maximum volume is quite loud too - but we did notice distortion at the highest levels. The minimum power consumption of the HP Envy 4-1000sg is almost identical to what we saw when we measured the Envy 6 and differs just by a few hundred milliwatts. The reason for this result is probably the current generation Intel Core i5-3317U in the Envy 6, which offers more performance but consumes less power at the same time. The Envy 4 (with the Intel Core i3-2367M) is more efficient than the Samsung Series 5 535U4C, which features less powerful AMD hardware but still consumes a few watts more. It doesn't come as a surprise that the Envy 6 requires more power under load. Our review model of the HP Envy 4-1000sg with the moderately powerful Core i3 processor consumes a maximum of 36 watts; the power adapter (65 watts) should be able to handle that easily. Hewlett Packard promises a battery life of up to eight hours. We were able to confirm this result using the Battery Eater Reader's Test: we measured 8 hours and 5 minutes. For this test, we deactivated wireless, turned the display brightness to its lowest settings, and used the power saver profile. To simulate a more real-life scenario, we use a script that visits different webpages every 40 seconds. The battery life of the Envy 4 was almost cut in half - we recorded 4 hours and 20 minutes before we needed to plug the notebook back in. Under maximum load, the Ultrabook lasts 2 hours and 23 minutes - a pretty average result. HP uses a 52 Wh lithium ion battery for this model - nothing spectacular. Given the power consumption and battery life of the notebook, the capacity is right around where we would have expected it to be. Great on the outside, mediocre in all other aspects: the HP Envy 4-1000sg is a mix of good and bad. HP's chassis are usually quite decent - and the Envy 4 is no exception: the aluminum used for the lid and around the palm rest not only looks very classy (and quite suitable for an Ultrabook), but also does its part in making the notebook quite rigid and sturdy. The keyboard and the touchpad also manage to convince. A quick look at the specs leads us to believe that the notebook with the outdated Sandy Bridge processor won't offer the best price performance ratio, since other (only marginally more expensive) Ultrabooks come equipped with substantially more powerful CPUs from Intel's Ivy Bridge lineup. Our tests confirm what we already suspected: playing games on this notebook requires the user to lower expectations significantly. For surfing the internet or office tasks, the notebook with its i3 processor is still suitable. We think that the larger HP Envy 6-1000sg is a better alternative for most users - not only because of the more powerful Intel Core i5-3317U, but also because of the larger 15.6-inch display. The Envy 6 is just slightly bigger, 400 grams (0.88 pounds) heavier, and costs only about 100 Euros (~$130) more. A strike against both HP Ultrabooks is due to the displays: our tests attest the low-cost panels' only marginal performance. Low maximum brightness paired with reflective display - outdoor use is almost out of the question. The Samsung Series 5 535U4C does a bit better here: same price category, slightly less performance, but a display that is substantially better. The entry-level Zen model Asus UX32A-R3001V also features a better display - but it costs more even though it comes equipped with the same CPU. The Ultrabook also suffers from some teething problems: the surface temperatures are above average (although still within acceptable limits) - even though HP promises the opposite with their CoolSense technology. The fan, which doesn't do a good job in cooling down the system, emits a high frequency whirring sound and gets annoying, since it constantly turns on and off. Last but not least, there are several Ultrabooks - some with Ivy Bridge CPUs and not outdated Sandy Bridge hardware - which offer a lot more performance but are not that much more expensive. Ultrabooks with the Intel Core i5-3317U usually offer a very decent price performance ratio. Even though the price of the Envy 4 has dropped to slightly below 600 Euros (~$780) at the time of writing, the question remains if that is money well spent - or if a more mature Ultrabook in the 700 - 800 Euros range (~$910 - ~$1050) would be the better choice. , (1 x 4 GB), 2 DIMM, 8 GB max. The HP Envy 4-1000sg: small, light, and inexpensive. Four rubber feet provide a solid basis for the notebook to sit on. In order to get to the internal hardware components, the entire bottom plate needs to be removed. The fan is on most of the time and is quite audible. Two RAM slots; one single 4 GB module. Anti-static foil covers the hard drive. The Broadcom module supports WLAN and Bluetooth. The power button features white illumination. The display can't be tilted back very far. The surface areas are made from brushed aluminum. The hinges are small but sturdy. The Beats Audio logo promises good sound quality. The chassis features high build quality. ...and so does the CapsLock key. The power adapter with 65 watts. The pleasing design and high build quality definitely meets Ultrabook standards. More power. 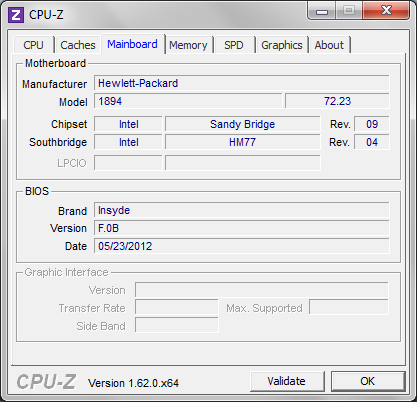 The old Sandy Bridge CPUs are only suitable for surfing the internet and simple tasks. Most notebooks with Ivy Bridge CPUs are not that much more expensive. The fan and its annoying high-frequency sound. For about 100 Euros (~$130) more, the HP Envy 6-1000sg offers more performance and a 15.6-inch display - and weighs 400 grams (0.88 pounds) more. The Samsung Series 5 535U4C utilizes lower performance AMD hardware, but comes with a DVD optical drive and a much better display. 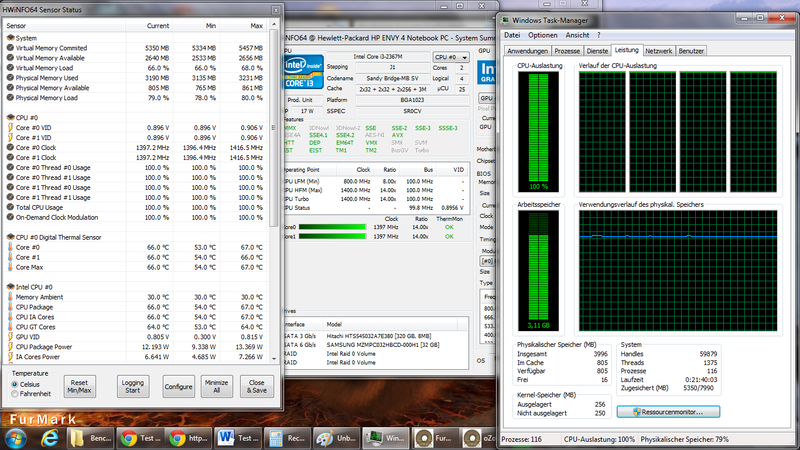 Both the Sony Vaio SVT-1111M1E/S and the Asus UX32A-R3001V are equipped with the same CPU as our review model.